Although it's not necessarily pegged to Halloween, the annual insanity surrounding the Pumpkin Spice Latte can get, well, a little scary. 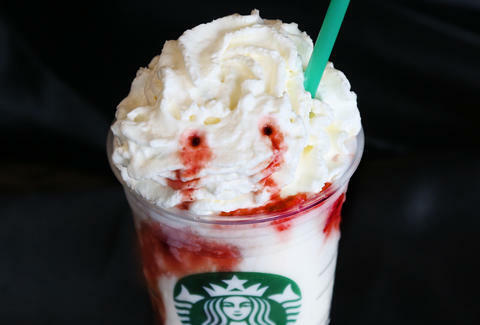 But now, just days before Halloween, the caffeinated maniacs at Starbucks have flipped their green aprons into menacing capes and have summoned a truly spooky, blood-stained drink back from the dead: the Frappula Frappuccino. Don't worry, though, it's not the blood of a sacrificial barista. Starbucks said the frightful Frapp is actually made by priming the cup with a layer of mocha sauce and whipped cream before blending white chocolate mocha sauce, milk, and ice and pouring it in on top. Then, they add a drizzle of strawberry puree to ooze like blood around the rim and finish the beverage with more whipped cream (and maybe puncture holes, if you're lucky) on top. While all that sugar certainly sounds scary, the company goes so far as to describe the drink as "fang-tastic," which we'll pardon this time in the spirit of Halloween. Similar to last year, the Frappula Frappuccino is available now at participating Starbucks locations across the US and Canada through Halloween. If you're really feeling festive, the coffee giant has you covered with Mummy Cake Pops, a Day of the Dead Cookie, and even a Starbucks Halloween playlist on Spotify. But really, folks, dropping five bucks for what's essentially drinkable candy is probably sufficient. Tony Merevick is Cities News Editor at Thrillist and would totally drink one of these things if they made it with coffee for him. Send news tips to news@thrillist.com and follow him on Twitter @tonymerevick.